Funding bids for musical instruments successful! In the first half of the autumn term, Miss Tooth, the new music teacher wrote two bids to fund musical instrument purchases for the school. One was written to the Music for All charity to purchase some violins and the other to the EMI Music Education Foundation to purchase some keyboards, as presently the ones in school are kindly on loan from Beaumont Leys Secondary School. Both bids were successful and Alderman Richard Hallam Primary School received £1085 funding for violins and £750 funding for keyboards. 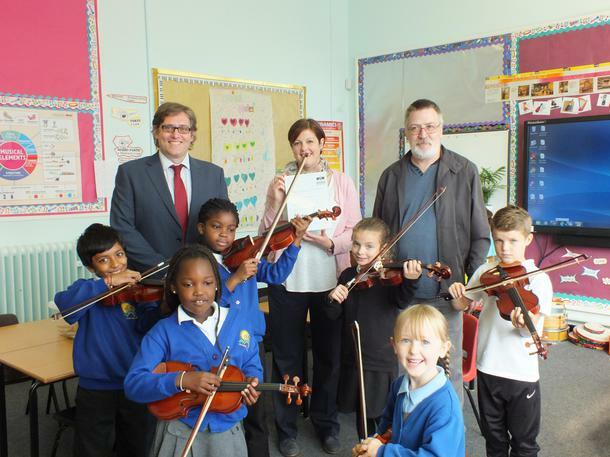 The violins have been purchased and lessons started for 10 year 3 and 4 pupils on Friday 30th October. The keyboards will be purchased during this half of the autumn term and pupils in music lessons and keyboard club will be able to use them.